At our 40,000 square foot home in Concord, New Hampshire, our engineers use a fleet of new equipment to design and manufacture the finest quality products. For heavy duty applications, the High Voltage, High Frequency Transformers are able to accommodate 15,000 volts with the highest levels of safety and accuracy. They are often found in high level applications, such as power supplies and lasers. 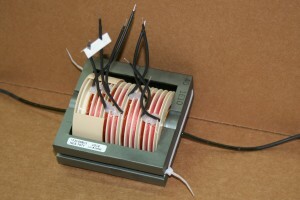 The applications for High Frequency, High Voltage Transformers are increasing with new applications for alternative energy generation such as wind turbines, for hybrid autos, and a wide array of other industrial applications in transportation (braking systems), manufacturing, waste cleanup (electrostatic precipitators), and plasma generation. No matter which options our clients choose, our High Voltage, High Frequency Transformers are designed and manufactured to fully comply with RoHS and other standards. Agile Magnetics employs computer modeling for all custom-designed High Voltage, High Frequency Transformers with our proprietary software, allowing for all electrical specifications to be included beginning with the design phase. We also perform 100% computer testing for each High Frequency, High Voltage Transformer we manufacture, with full lot data included with every packing slip when requested. The finest quality in the industry is guaranteed with our ISO 9001:2008 and AS9100 certifications. Our High Voltage, High Frequency Transformers can be built to UL, CUL, VDE, and CE standards, and can feature UL and CUL markings when requested. To learn more about our High Voltage, High Frequency Transformers capabilities, contact Agile Magnetics today.